Patients with renal failure require dialysis via an arteriovenous fistula or dialysis catheter. 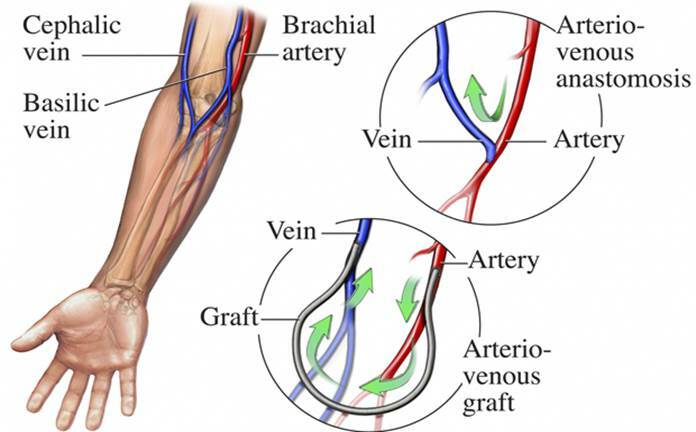 The fistula is created by a vascular surgeon preferably in the arm, connecting an artery to a vein. Monitoring and maintenance of the fistula is vital in ensuring its longevity for dialysis use. Over time, dialysis and high flow in the venous side of the fistula can cause narrowing or occlusion and inhibit proper flow for dialysis. This problem is usually discovered during a dialysis treatment or because flow through the fistula is no longer palpable. An interventional radiologist can perform a fistulagram and insert a small catheter and inject contrast into the fistula under x-ray guidance to look for stenoses or occlusions. These narrowed segments can be treated in the same outpatient setting with balloons and stents to help improve flow in the fistula. 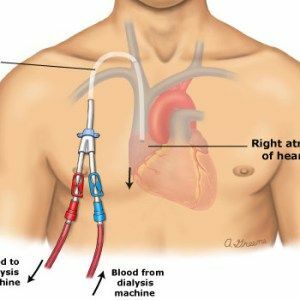 When a fistula is not possible, some patients receive dialysis through a temporary or long-term dialysis catheter. These catheters can be placed by an interventional radiologist in the outpatient setting. All of these dialysis access procedures are performed with local anesthesia and IV sedation with same day discharge.